Both House and Senate committees want the FBI to hand over any records related to the fired FBI director's conversations with President Trump. We may be hearing publicly from recently fired FBI Director James Comey sooner rather than later. House Oversight Committee Chairman Jason Chaffetz has scheduled a full committee hearing on the FBI's independence for May 24. And he plans to have Comey testify, though he apparently still needs to get in touch with him. The scheduled hearing comes after The New York Times published a report Tuesday claiming Comey wrote a memo about his conversation with President Trump. The memo reportedly states that Trump asked Comey to drop the bureau's probe into former national security adviser Lt. Gen. Michael Flynn. The oversight hearing will happen the same day as the deadline Chaffetz gave the FBI to hand over any documents or recordings related to any conversations between Comey and Trump. The Senate Intelligence Committee and Senate Judiciary Committee have also requested similar records from the FBI. The Senate Intelligence Committee also wants Comey to testify both publicly and in private. 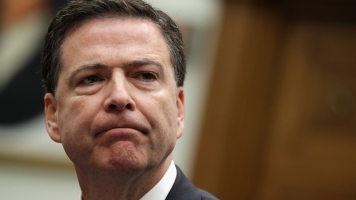 While it's not yet confirmed whether Comey will accept any of the invitations to testify, reports citing sources close to Comey have said the ousted FBI director wanted to testify publicly rather than in a closed setting. Comey declined to testify before the Senate Intelligence Committee in the days following his firing.